The Equality Network are holding a number of special discussion events in more rural and island communities of Scotland. There are lesbian, gay, bisexual, transgender and intersex people in every part of Scotland from our biggest cities to our smallest settlements and islands. While LGBTI equality has progressed considerably in recent years the lived experience of LGBTI communities in urban settings is vastly different to that of LGBTI communities in more rural and island settings. Our Scottish LGBT Equality Report highlighted that the experiences of LGBT people vary considerably across the country. Those living in rural parts of Scotland report a significantly worse experience than those living in urban areas, including more prejudice, greater isolation, and less access to local services that meet their needs. Almost a quarter of LGBT respondents living in rural areas (24%) described their local area as a ‘bad’ or ‘very bad’ place for LGBT people to live, compared to 12% of those living in urban areas. Almost half of LGBT respondents living in rural areas (47%) said they feel isolated where they live because they are LGBT, compared to almost a quarter (23%) of those living in urban areas. A majority of LGBT respondents living in rural areas (55%) said that services in their local area do not meet the specific needs of LGBT people, compared to a third (30%) of those living in urban areas. 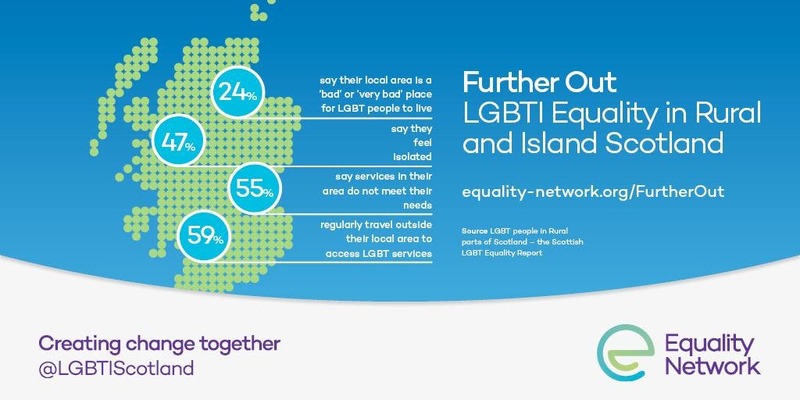 Six out of ten LGBT respondents living in rural areas (59%) regularly travel outside of their local area to access LGBT services, compared to just over a third (35%) of those living in urban areas. Four out of ten LGBT respondents (43%) have either moved, or considered moving, to live in a different area because of being LGBT. That’s why we’re holding our biggest conversation yet, and we want you to take part. Why not join us and share your experiences of LGBTI life outside our biggest cities. The events are also a good opportunity to meet LGBTI people at events in your area and discuss other LGBTI issues you’d like to raise. Each event will last around two hours and refreshments will be available. You do not need to register but doing so will help us to better plan the event. All events are open to lesbian, gay, bisexual, transgender and intersex people, their friends, family and supporters.